Kenny J: It’s done. Seventy-seven issues over two main titles and we find ourselves at the last chapter of Jonathan Hickman’s epic Avengers run at Marvel. 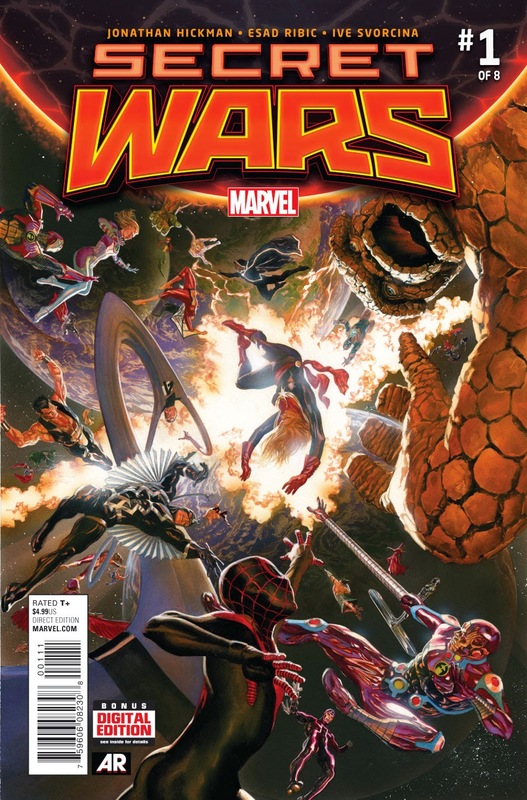 Secret Wars, while not a reboot, is sure to mix up the Marvel Universe as we know it. There has been some worry from certain quarters whether there will be anything for them once the dust of 'Battleworld' settles but I think Marvel are very much concentrating on their brand and how it appeals to a younger readership. However, from Secret Warriors through Fantastic Four, Hickman hasn’t made a misstep, so I trust him to see out this eight-issue event with aplomb and guide Marvel into a new era. The future starts here. Speaking of the future and the past and everything in between, this week sees the return of one of my favourite books, Rocket Girl. Brandon Montclare’s tale of a girl lost in time is packed full of retro cool, beautifully rendered by Amy Reeder. It’s a slight week for me but full of quality, both new and old, as The Wicked + The Divine #10 rounds it out. Matt C: As Kenny says, it's all about Secret Wars this week. I've spent a lot of time invested in Hickman's work at Marvel so I've got my fingers crossed tightly that he delivers with this event. His previous Marvel event, Infinity, was the best the publisher has offered in the last few years, so that bodes well. The only other Marvel book I'm picking up is Kanan: The Last Padawan #2, a series that had an impressive debut and is part of the ongoing reaffirmation of my love of Star Wars during 2015, following that The Force Awakens trailer and Star Wars Rebels itself (have you seen that trailer for the second seasons??). From there, it's over to Image for Descender #3, Jupiter's Circle #2 and Nailbiter #12 to complete my pull for the week.